The student-engineers of the Cyclone Racing Formula SAE team are ready to race at Formula North in Canada. Larger photo. Photo courtesy of Formula North. 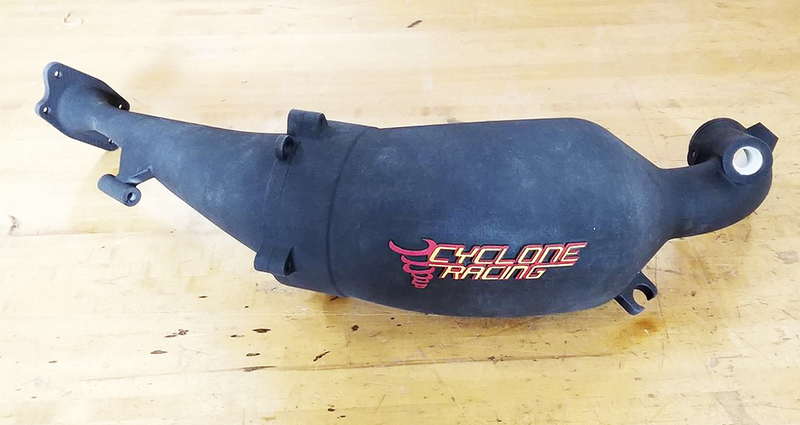 6-26-18 update: The student-engineers of Cyclone Racing spent the two-plus weeks between Formula North and Formula SAE Lincoln troubleshooting their car’s engine and paddle shifting system. With all that work, team members expected a solid follow-up to last year’s fourth-place finish in Nebraska, said Jake Weltz, a senior in mechanical engineering from Denison and the team’s project director. But, after a good run through the cost report (fourth of 80 teams) and the other business and design events, the team ran into mechanical troubles on the track. The team finished an acceleration run (5.8 seconds over 82 yards) before engine and aerodynamic problems took it out of the short autocross race and the skid-pad handling contest. That led to the second engine swap in as many competitions and fingers crossed for finishing the 13.7-mile endurance race. About a third of the way through the long race, electrical problems killed power to the car and Cyclone Racing was done for the season. The team left Lincoln 51st overall. 6-6-18 update: Engineers like to say they’re problem-solvers. 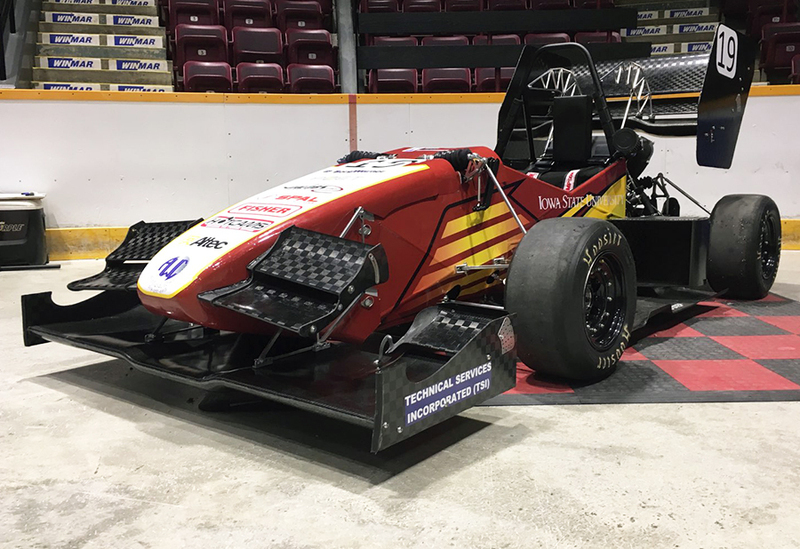 Well, the students of Cyclone Racing Formula SAE had some hands-on training as they tackled problem after problem at the Formula North competition in Barrie, Ontario, Canada. The biggest problem? Engine trouble. The solution: “a hotel parking lot engine swap,” said Jake Weltz, a senior in mechanical engineering from Denison and the team’s project director. Then the team had to fix fuel leaks and check electrical connections. Next was a sprint to tech inspection and then a failed noise test. The team ran out of time to adjust the exhaust system and so missed all racing and handling events. But the racing season isn’t over. “As for the next couple weeks, we have a big list of changes we are working on regarding fuel, brakes, aerodynamics and general suspension setup,” Weltz said. The team competes June 20-23 at Formula SAE Lincoln in Nebraska. AMES, Iowa – Brad Bauer motioned to the composites area of Cyclone Racing’s campus shop. Come on back and take a look at some of the Formula SAE team’s latest aerodynamic innovations, said Bauer, a May graduate in mechanical engineering from Wilmington, Illinois, who’s the team’s technical director and will soon be working as a design engineer. There on the shop floor were five smooth and sculpted carbon fiber pieces that would be attached to the bottom of the team’s latest mini open-wheel racing car. Those pieces will form an aerodynamic undertray – the first one attached to a Cyclone Racing machine. That undertray is all about accelerating the air passing below the car. That creates low pressure underneath and tire-sticking, corner-hugging, higher-pressure downforce on top. The car will also have fully adjustable front and rear wings to create even more downforce. 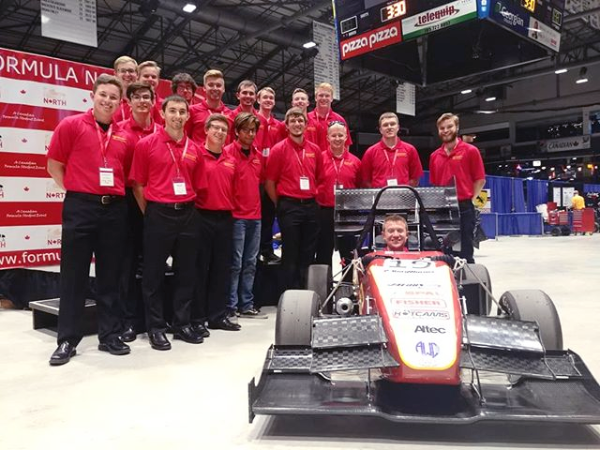 But there are times – think roaring down a long straightaway – when the team needs speed more than downforce, said Jake Weltz, a senior in mechanical engineering from Denison and the team’s project director. So the student-engineers have built a drag reduction system that temporarily flattens the rear wing flaps, allowing air to flow through the wing. That drops downforce and boosts top-end speed. That’s about 300 pounds of air pushing down on a car and driver that weigh about 550 pounds, he said. But the engines in these student-designed and student-built cars (in Cyclone Racing’s case, a Yamaha YFZ450 from an all-terrain vehicle) only produce about 45 horsepower. Is that enough power for an aero package to make a difference? Well, Cyclone Racing is about to find out. The team competes May 31-June 3 at the Formula North competition in Barrie, Ontario, Canada. The team will also compete June 20-23 at Formula SAE Lincoln in Nebraska. The Lincoln competition is sponsored by SAE International, formerly the Society of Automotive Engineers. The competitions feature static events involving costs, engineering design and business presentations. There are also dynamic events that include an endurance race, a short autocross race as well as tests of skid-pad handling, acceleration and fuel efficiency. As he looks at past results, Weltz said aero performance does make a difference. The leaders of Cyclone Racing have high hopes for getting some speed out of this year’s car. In addition to aero innovations, the car will have lighter and smaller differential gearing, a shorter chassis, a stiffer suspension and a better paddle shifting system, said Cole Ignaszewski, the team’s chassis lead and a junior in mechanical engineering from New Richland, Minnesota. Team members look at all the innovations – plus last year’s best-ever, fourth-place finish in Lincoln – and say they’re ready to race. Cyclone Racing's formula car makes its season debut at the Formula North competition in Canada. Larger photo. Photo courtesy of Cyclone Racing Formula SAE. Cyclone Racing's Formula SAE team is ready to put its latest racing car to the test. The mini open-wheel machine hits the Formula North circuit this week for a shakedown competition. Then it's back on track at Formula SAE Lincoln in late June for more racing. Will all of this year's innovations -- comprehensive aero package, lighter differential, shorter chassis, stiffer suspension, better paddle shifting -- add up to high performance? We'll have an answer soon.